Left: Webster associate professor and organizer of the Dec. 4 conference, Jubin Goodarzi (photo by Delphine Schacher). Right: Webster student and president of the Webster Humanitarian Association, Jessica Wright (photo by Kristian Skeie). In commemoration of Webster University’s centennial anniversary, the Geneva campus inaugurated its Centennial Speaker Series with a theme that examines a critical issue from the last 100 years of human history and involves collaboration among multiple Webster academic departments. “Open Wounds: A Century of Crimes against Humanity" brought together the International Relations, Media Communications and Psychology departments to reflect and present on this common theme. 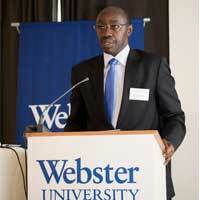 In order to mark and to better understand these important historical milestones, including their lessons and legacies, Webster University Geneva invited scholars, experts, activists and witnesses to shed light on the subject of crimes against humanity and examine other issues related to the aftermath of genocide and the long-term ramifications of such horrendous events, including justice and reconciliation. Part 1, “Life After Genocide,” a photographic report on what life is like after genocides in Bosnia and Rwanda; and Part 2, "Open Wounds, Armenians, Turks, and a Century of Genocide,” a presentation on the post-genocide political history of Armenians and Turks, were held in November. It is noteworthy that 2015 also marks the centenary of the first major genocide of the 20th century, the mass killings of the Armenians in 1915. It is also 70 years since the end of World War II and the Holocaust, 40 years since the Communist Khmer Rouge seized power in Cambodia and carried out murderous policies, and 20 years since the Srebrenica massacres, the worst atrocity committed in Europe since the World War II, which was part and parcel of a policy to “cleanse” Bosnia of its Muslim population. The main purpose of the conference was to shed light on different aspects of genocide, most notably, its root causes, its consequences, mechanisms established by the international community to prevent and punish genocide, and their efficacy. In addition, the conference addressed other issues related to the aftermath of genocide and the long-term ramifications, including justice, reconciliation and healing. The conference focused on four general themes: ideologies, intolerance and genocide; historical perspectives on genocide; prevention and punishment of genocide; and justice, reconciliation and healing after genocide. The conference featured a range of speakers including policymakers, diplomats, scholars, international lawyers, NGO representatives, survivors of genocide, photojournalists and documentary film producers. The opening remarks of the conference were made by Madam Hasmig Tolmajian, Minister Plenipotentiary of the Republic of Armenia, and the keynote address was delivered by Francois Xavier Ngarambe, the ambassador of Rwanda to Switzerland and the United Nations. These two speeches set the tone for what proved to be an auspicious day. They were followed by a presentation on the role of ideology in genocide by Jonathan Leader Maynard of Oxford University in England. In general, the speeches went from strength to strength with each participant making a rich and valuable contribution to the event, including three Webster students from Australia, Canada and Bosnia who clearly demonstrated the talent and potential of our student body. In the afternoon session, Enver Husic, a survivor of the Bosnian genocide gave a moving personal account of how he survived the massacres in the summer of 1995 that stirred the audience, while Webster faculty member Vicken Chetarian provided a synopsis of his newly-published book on the Armenian genocide. Ros Thomas, the head of psychology at the Geneva campus delivered a tour de force on the psychological aspects of healing after genocide. Kristian Skeie of the Media department presented powerful pictures of life after genocide in Bosnia and Rwanda, and independent documentary filmmaker Andrew Tkach, who has produced reports for major television networks such as CNN, ABC, NBC, CBS and others, showed a documentary he had made with Christine Amanpour for the CBS newsmagazine 60 Minutes a few years ago on the Rwandan genocide. Overall, the conference was a resounding success, capping what has been a fruitful year in terms of events at Webster University Geneva. Other events included the annual humanitarian conference, the security forum, a photographic exhibition and a book launch, among others.